May 8-14 is National Women's Health Week. Preliminary data from the largest colposcopy study in the U.S. is having a positive impact on women with abnormal Pap smears. 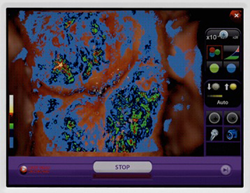 DySIS measures the cervical epithelium automatically using Dynamic Spectral Imaging and producing a map of the cervix. DySIS Medical Ltd. (DySIS), an innovative women’s health company that offers a new cervical imaging technology (dynamic spectral imaging) for women with abnormal Pap smears, announced today it will present initial findings from the IMproved PRactice Outcomes and Value Excellence in Colposcopy (IMPROVE-COLPO) at the Annual Clinical and Scientific Meeting of the American College of Obstetricians and Gynecologists (ACOG), to be held in Washington, D.C., May 14-17. The objective of the 11,000-patient IMPROVE-COLPO study is to measure outcome improvements in detection of cervical neoplasia (pre-cancers) when using the DySIS Advanced Cervical Imaging System compared to standard methods. The results from two community clinics to be presented at ACOG, show that biopsies assisted by dynamic spectral imaging and mapping of the cervix increased detection of high-grade neoplasia by 36.8 percent over standard colposcopic visualization. DySIS also recently presented early data from nearly 3,000 women with low-grade pap smears that showed detection of patients with high-grade disease increased by a third in the DySIS study arm compared to the standard care arm. More than 12,000 U.S. women are diagnosed with cervical cancer annually and 4,300 die from the disease. The DySIS digital colposcope can enhance a doctor’s ability to diagnose and manage cervical neoplasia, by detecting changes in a woman’s cervix and helping to guide biopsy selection and the best course of treatment to prevent cervical cancer. DySIS Medical has its global headquarters in Edinburgh and US Headquarters in Tampa, FL. The company is committed to saving lives through the early detection and diagnosis of disease using biophotonic innovations. It aims to be the global leader in automated optical molecular imaging technologies for medical diagnostic and screening applications. For more information, please visit: http://www.dysismedical.com or call 844-DYSISMED.